I recently coached a client in presentation skills and as a token of appreciation, he sent me a $150 gift card to Ruth’s Chris steak house. My wife and I decided to use it to celebrate our eighth wedding anniversary. I have eaten at Ruth’s Chris before and fully intended on tearing through the gift card like Caesar through Gaul, but what happened next was a very expensive lesson in the power of communication. When we arrived at the restaurant, my wife and I requested a booth in the corner so we could be fully present with each other. We ordered wine and perused the menu. I wouldn’t call myself cheap, but I have yet to look at the prices on the menu at Ruth’s Chris Steakhouse and not wince ever-so-slightly. Maybe it was the wine. Maybe it was the mood of the moment, but I decided to throw caution to the wind and order the whole Maine Lobster. I love lobster. Some of my fondest childhood memories are of my father returning from business trips to New England with a crate of live Maine lobsters. I can remember being woken up at eleven o clock one night because my father’s plane had been delayed, but that wasn’t going to stop us from having a lobster feast. My mother started boiling a pot and we dined into the wee hours of the morning. That’s where my love of lobster began and now I was continuing it at Ruth’s Chris steak house. The waiter described the specials, raved about the filet, and finally I asked “hows the Maine lobster?” His eyes lit up as if I’d asked about his children. He went into a description that had me giddy with excitement. “How much?” I asked. “$37.00?, bring me a Maine Lobster”. It was every bit as good as he described. The succulent morsels dissolved in my mouth, the butter dripped from my chin and my smoking hot wife stared lovingly at me from across the table. I was in heaven. We enjoyed the evening all the way through the after dinner B&B. When the check arrived, I pulled out my gift card to see if we had fufilled the limit…we had. Maybe it was intentional or maybe it was because english was our waiters second language, but apparently, when I asked how much the lobster was, he left off the words… PER POUND. I ended up paying $120.00 for a beady eyed shellfish! I was speechless. I should have become suspicious when the manager came over to shake my hand and thank me for ordering the lobster. I now know why the kitchen staff was lined up at the door dabbing their eyes. They were saying goodbye to an old friend. 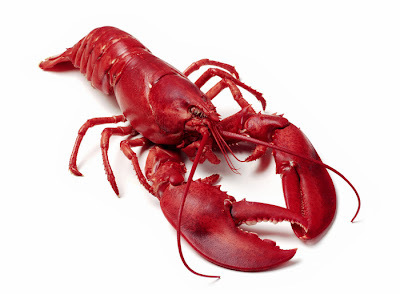 That damn lobster was probably soaking in a tub for years, growing fat, waiting for a sucker like me to come along. What would you do if you were in that situation? I wanted to wring the waiters neck, but I didn’t. I didn’t even complain. I simply paid the bill, tipped the waiter and left with my wife. I decided that the lack of communication was as much my fault as it was Raul’s. Will I go back to Ruth’s Chris Steakhouse? Probably, although that particular restaurant has seen the last of me. There are two parts to effective communication. Listening is as important as speaking. My fault was in my assumption and not asking questions. His fault was not presenting all of the facts. Did Raul benefit from the lack of communication?… yes and no. Sure he made about thirty dollars more on his tip, but he lost the opportunity to create a profitable relationship. Every time you interact with a customer, it is an opportunity to seed the relationship for future opportunities. Had Raul been more forth coming with the information, he would have created an emotional debt that I would have paid at a future date. Maybe with friends, clients, or even a party of ten. Are you creating a culture of openness with your clients, customers or team? Do you communicate effectively? As the presidential campaign is in full swing, Mitt Romney is being blasted for not sharing his financial records, and this is ticking some folks off. I don’t care which side of the aisle you’re on, I believe that those who find this offensive do so, not because they care how much money he makes, but rather because of the lack of communication. When you don’t communicate effectively you diminish trust. No trust? No Sale! Great example of how one tidbit of withheld (intentionally or not) information created a negative outcome. Full disclose is essential and necessary to create trust and a a long-term relationship. Thanks for sharing it!